Una de las combinaciones de color que antes jamás me hubiera imaginado usar es la del rojo y el rosado. Son colores que contrastan entre ellos pero que, como cosa rara, se complementan. Así que chicas, no duden en incluir esta combinación en sus looks. En este look los combiné con una falda denim y quise arriesgarme un poquito más agregando botines plateados. Al final del post les dejo algunos looks de inspiración para que tengan muchas ideas mas de como llevar estos colores juntos. One of the color combinations that I would have never imagined wearing before was red and pink. They are colors that contrast each other but, as a rare thing, they also complement each other. So girls, don’t hesitate to include this combination in your looks. In this look I combined them with a denim skirt and I wanted to take a little more risk by adding silver booties. At the end of the post I leave some inspirational looks so that you have many more ideas on how to wear these colors together. I believe this color trend will not only last for the spring season, but it’ll roll into summer as well. Being a contrasting color, it’ll definitely add a little more color to our skin, even if we are not tanned yet. And, once we are tanned, tangerine will definitely help highlight that color even more. It’s perfect for putting colorblock outfits together (outfits #4, 7 and 9), and its best allies are royal blue, fuchsia and purple. It’s also great to highlight a more simple look, like in outfit # 6. And if what you want is to wear this trend on more formal occasions, the only thing you have to do is use your complements (bags, belts or shoes) in black (outfit #7). 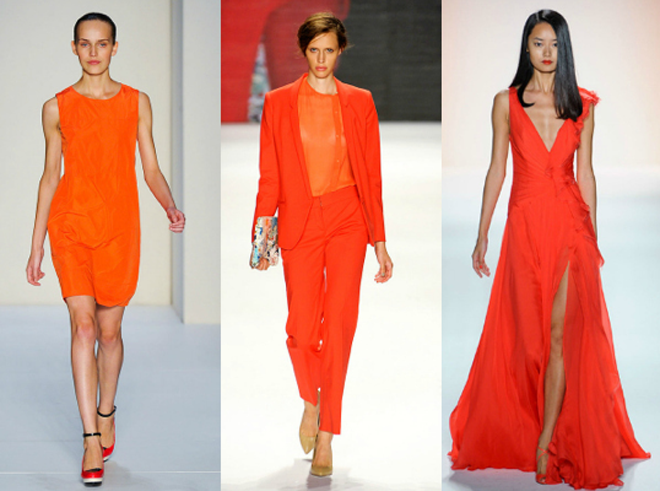 Tangerine is also an excellent option for use as a “one minute makeover” since just by adding shoes, necklaces or bags of that color will make your look change completely. What do you think of this trend? What other ways would you use it? Creo que la tendencia de este color no solamente será de la primavera, sino que se alargará hasta el verano. un lindo bronceado, el tangerine, hará resaltarlo aún mas. cartera en este tono, hará que tu look se vea completamente diferente. ¿Les gusta esta tendencia? ¿De qué otra forma lo usarían?